Grease an 8cm deep, 6-cup capacity, heatproof, microwave-safe dish. In a bowl, mix together flour, sugar and orange rind. Whisk butter, juice and egg in a separate bowl then stir into flour mixture until well combined. Pour into the greased dish and ensure a smooth, even surface. 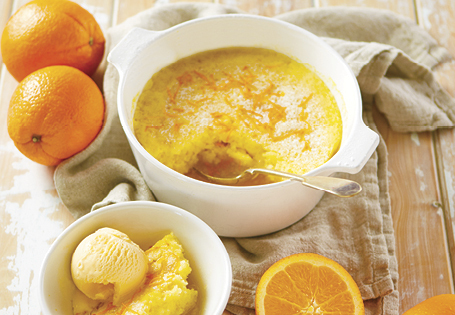 Make sauce: Pour sugar and orange juice into a heatproof, microwave-safe bowl or jug. Cook on MEDIUM (50%) power for 3 minutes, stirring every minute, or until sugar dissolves. Then cook on HIGH (100%) power for 1-2 minutes or until sauce boils. Pour hot sauce evenly over the pudding. Place pudding onto a microwave-safe rack or upturned dinner plate. Cook, uncovered, on MEDIUM (50%) power for 8 - 9 minutes or until a skewer inserted around the edges is clean, but the centre remains a little sticky. Remove dish and cover tightly with foil. Stand for 5 minutes or until centre is no longer sticky.